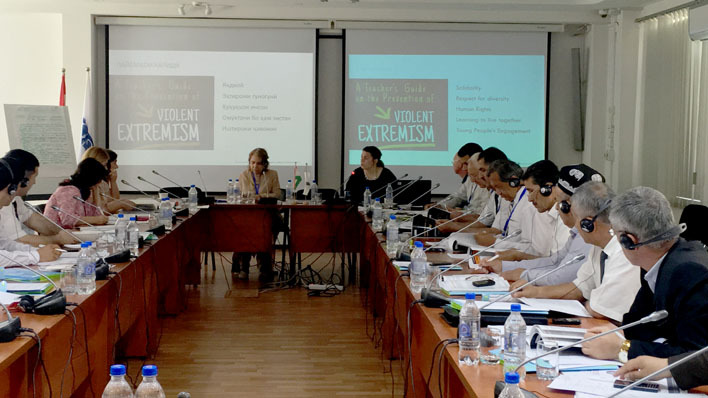 OSCE Programme Office in Dushanbe, in close co-operation with UNESCO Almaty Cluster Office, organized a two-day training on preventing violent extremism among youth in Dushanbe on 24-25 May. The train-the-trainer course brought together 17 teachers from the Khujand, Kurgan-Tyube, Kulyab, Garm, Nurobod, Tursunzoda, Shahrinav and Rudaki districts of Tajikistan. It aimed to strengthen the role of education in building community resilience against violent extremism and terrorist radicalization, as well as empowering local teachers in taking preventive measures against violent extremism. The UNESCO Teachers' Guide on the Prevention of Violent Extremism was guiding the training. The Teachers Guide provides practical advice on when and how to discuss the issue of violent extremism and radicalization with learners, help teachers create a classroom climate that is inclusive and, open discussion and critical thinking. OSCE emphasized the importance of education and a ‘whole-of-society’ approach to tackling the phenomenon of violent extremism. Upon the completion of the train-the-trainer course, the trained educators will be engaged in a series of training events across the Khatlon and Sughd regions, as well as in Rasht and in other districts. This capacity-building activity is part of the support to the Government of Tajikistan in implementing their National Strategy and Action Plan on Preventing Violent Extremism and Terrorism by 2020.